The problem with most short rams is that you pull in warmer, and usually dirtier, air from under the hood. I lost power with mine, because the intake air temperatures went up significantly (sometimes ~40-50 deg F higher in traffic). Look for a kit that would pull in fresh air from as far forward as possible. Better yet, consider a cold-air intake. You'd stand a chance of gaining some power and won't be cleaning/changing filters nearly as often. Since your throttle is intentionally the bottleneck in the intake system, higher flow filters won't increase your mileage. If anything, pulling in slightly warmer air would reduce the fuel needed to mix with the less dense air. But that wouldn't be much, and it would be significantly worse if the ECU backs off the timing if the air is too hot. 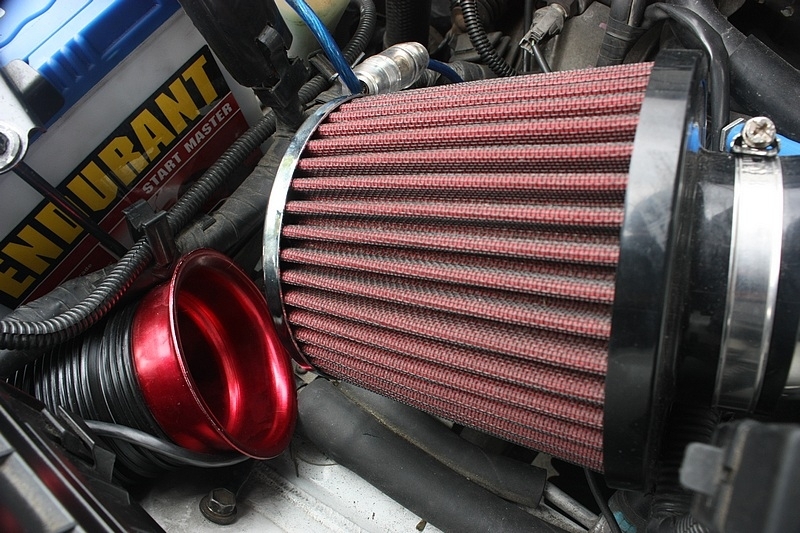 thank you Dan_H, i will look into the cold-air intake. 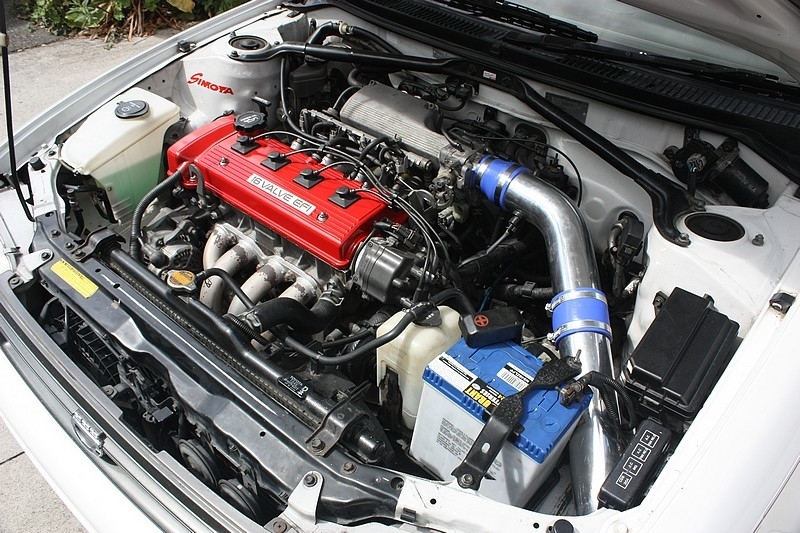 I agree with Dan H that an intake system that draws cold air is desirable if you are trying to get Maximum HP, etc. However, I do not agree witht the statement that a higher flow filter will not increase your mileage. That depends on how restrictive the filter you are currently using is. Dirty air filters are probably the single largest contributor to poor MPG. 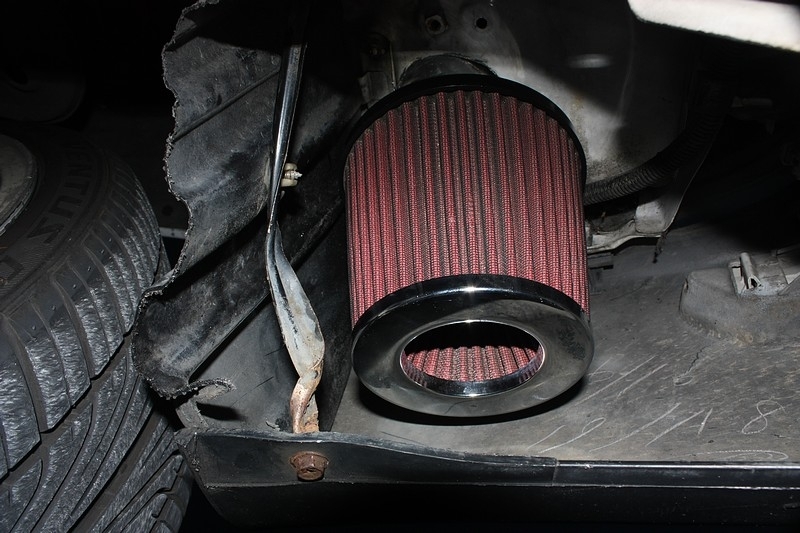 Some cars that come with relatively undersized filters for their CID will suffer from sub optimal mileage and performance due to the undersized filter. Particularly in these cases, a higher flow filter element can help the mileage and the accelearation, depending on where you keep your foot. An overly restrictive filter can create a partial vacuum between the filter and the throttle plate which reduces the volumetric efficiency of the engine and therefore the torque, which causes the car to need to be in a lower gear going up hills, etc. which reduces the MPG. +1. I was using a short ram intake for about 6-months and it was sucking in far too much hot engine bay heat. I considered making a divider out of sheet metal to block some of the heat, and even considered wrapping the intake pipe in heat reflective tape. I actually rigged up an aftermarket induction hose in hope of getting more air to the SRI, which sort of helped, but still wasn't getting sufficient cold air. In the end I decided to just make my own custom cold air intake. All it took was two 125-degree 3" intercooler pipes, a couple of joiners and clamps, and a few hours of my time to cut the pipes and align everything properly. The pod filter now sits completely out of the engine bay, just in front of the wheel. The intake sound was slightly reduced due to the filter being further away, but the performance increased which is all that matters. I also bought a sri but when I installed it and took it for a spin, my check engine light, Traction Control light, and VSC light came on, when i replaced the stock intake box, all the lights went off, does anyone know what caused this to happen? 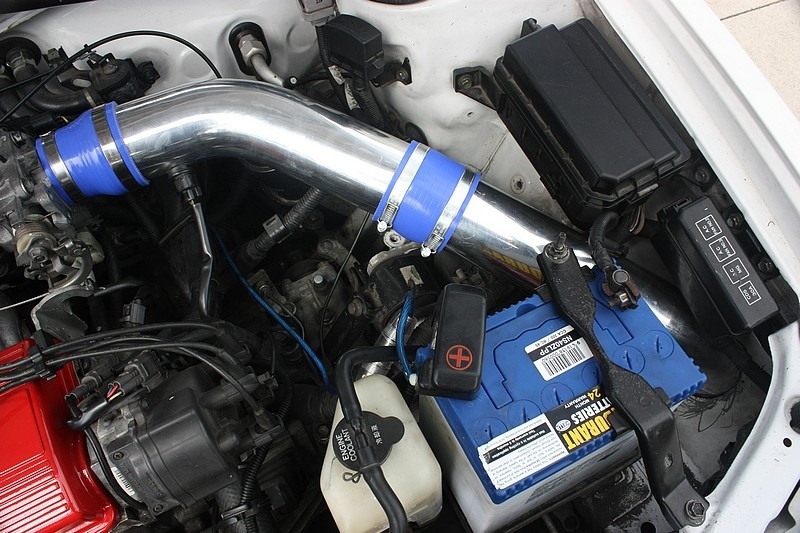 Did you make sure to hook up all the sensors and hoses to the aftermarket intake? There is a smog pump on the OEM setup that many aftermarket intakes do not make provisions for. Leaving that disconnected will automatically set a CEL. Also, how far the MAF sensor projects into the air stream and how close it is to the filter will also influence if you get a CEL or not. Kiwi-Corolla, how did you manage to get the air intake tube to the right of the battery out?? I couldn't figure out how to remove it, I was going to run a cold air intake through the hole and put the filter where yours is in picture 7061 and 7060, but I settled on an SRI because I didn't see any clear way to get it out... Any tips on removing the tubing? 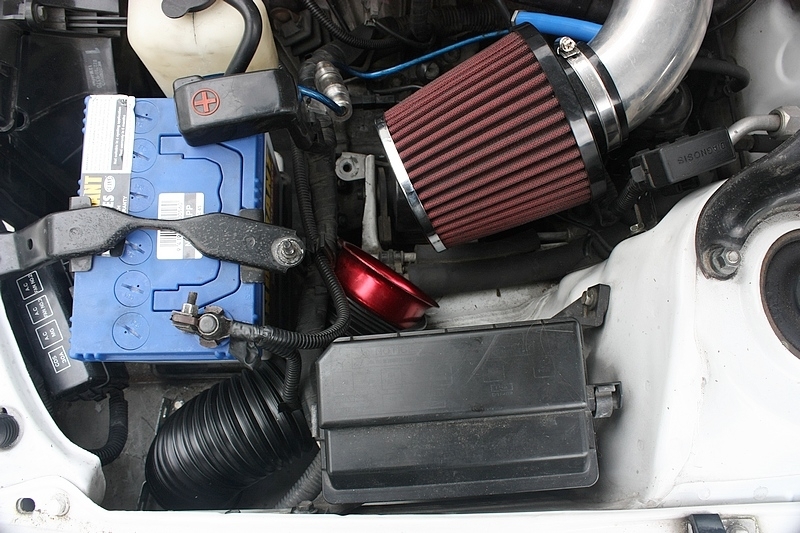 And how big of a difference in power did it make when you switched from a short ram to a cold air intake? I have a '96 DX with the 1.8 liter 7A-FE so it should be exactly like the car in your photos. Alright! After about 45 minutes worth of wrenching I managed to remove the resonator box. Sweet success! Haha. Thanks a lot for the advice! I'm thinking about using a 3-inch tube to route the cold air intake in front of the wheel, since that's the diameter of the SRI I'm currently using. What kind of tools could I use to widen that hole from 2.5 inches to 3? Or will there be clearance issues in the space behind the battery when using a 3-inch pipe? No worries about the advice. Glad you got the resonator box out. As for making the hole bigger, the best thing to use would be a Dremel with a decent grinding tip. The cheaper tips will wear away far too fast, and in some cases, fling off while you're grinding (which happened to me). I invested in a proper Dremel branded sanding/grinding kit and it still has plenty of life left on the grinding stones. Other than that, you could just use a file if you've got a lot of energy to burn, lol. Just trace a 3" hole onto the metal (I found that a jam jar works well for this) so that you know where to stop grinding. The piping I used was 3" and it fit perfectly alongside the battery. You will have to move it over a few centimetres to the left, but you can still utilise the factory battery clamp and tray. I'd also recommend putting a thin bit of rubber around the hole where the pipe goes through as this will stop any vibration at idle etc. Sounds good to me, how much does a Dremel cost though? I'm thinking if it costs too much then I'll just use a file like you stated, I'm on a bit of a tight budget, haha. Also, what should I do about the Air Intake Temperature sensor? I made a loop out of thick wire to hang it from right beside the filter on my SRI because the pipe I'm running doesn't have holes in the right places to mount a sensor. Would I need a different pipe, or should I just home make a hanger to mount it on as close to the intake as possible? Thanks a lot and sorry for all the questions!! I want this setup to be done right the first time. A genuine Dremel will cost you a little, but you can get cheaper non-genuine ones. They're called rotary tools. Check out your hardware store and you're bound to find one for around $20. As for the air intake temp sensor, you'll need to drill a hole in the piping near the throttle body (look at my pics to see where I put mine). 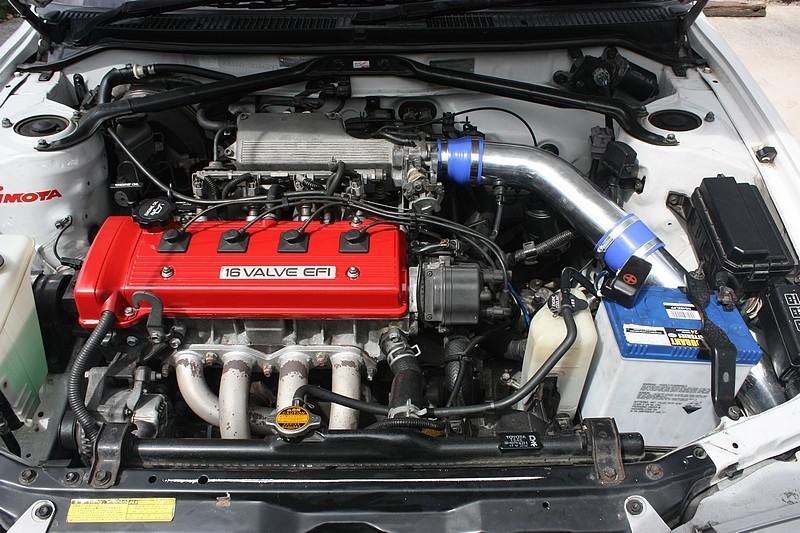 You can't just have it hanging in the engine bay, it HAS to be inserted into the pipe. The best way to drill the hole is to put a bit of masking tape over the part you're going to drill, then position your drill piece in the middle of the masking tape and start drilling a hole (use the biggest drill piece possible). The purpose of the masking tape is so that the drill piece doesn't slip on the pipe as you're drilling, which would cause noticeable scratching. Once you've got a small hole in the pipe. Take your Dremel (or a small file) and slowly make the hole bigger. I used the rubber bung off my SRI to hold the sensor in place afterwards. So once the hole is just under the size of the rubber bung, squeeze it in there and see if it fits properly. It doesn't matter how rough the edges of the hole are, as long as the rubber bung makes a nice seal around the edges. The important part is to drill the hole slowly so that you don't make it to big (I marked mine with a marker so that I knew when to stop). This of course should be the last step you do before installation (after you've cut your pipes to the right size and aligned everything). It all sounds harder than it actually is, but if you've got a bit of patience, it'll be like a walk in the park. Good luck! Let me know if you have any more questions. I was surfing the web for other methods of boring out a 3 inch hole and found something called a hole saw, it looks like it just attaches like a standard drill bit but has blades on the outside like a wood auger. If I were to buy one of these, would it work as well as a Dremel for cutting the metal? I already have a drill and hole saws are significantly cheaper than buying a Dremel kit. On a side note, I have some silicone couplers and some rubber stoppers left over from my SRI build that should be perfect for mounting the intake air temperature sensor and stopping vibrations of the pipe. A hole saw would be nice, but it would be pretty awkward to use since the hole you have to cut bigger is tucked just inside the framing for the engine bay. Would be easy if you were cutting straight down and could put pressure on it from the top, but since you need to cut on an angle it may not work at all. It would be much quicker and more precise, just a shame that you have to cut on an angle.